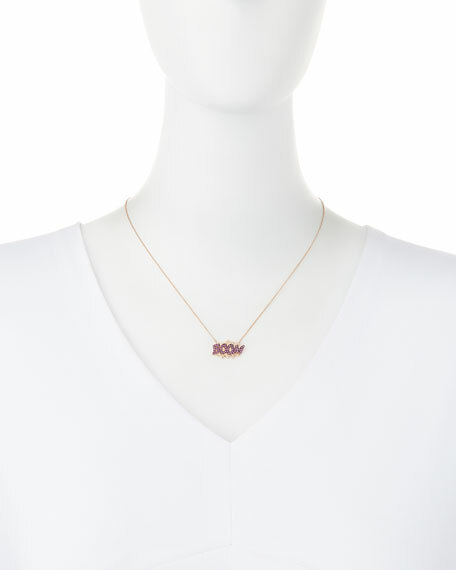 Diane Kordas "Boom" necklace from the Pop Art Collection. Jagged pavé white diamond pendant. 0.31 total pink sapphire carat weight. Since her first collection of bracelets inspired by the evil-eye symbol, Diane Kordas has been drawn to ancient spiritualism, art, and architecture. Centuries-old artifacts are reinterpreted with a contemporary lens, in 18-karat gold and diamonds. Her latest collection, Amulette, holds a surprise: each pendant is meant to hold a favorite fragrance.